Even though I still feel young, the reality is that I'm in my mid-fifties now. So I've developed a healthy, everyday morning routine that includes, a glass of orange juice, a women's multi-vitamin, and a natural probiotic that aides my digestive system balance. I've come to realize that it isn't just one thing that keeps me healthy, but a combination of things that are smart and easy for me to do. I know how important it is to start taking better care of myself if I want to have decades of life ahead of me. I have wonderful grown children and grandchildren that I want to enjoy for many years to come. And a pretty long bucket list of things I still want to do and accomplish. For me, a major part of feeling well is having good digestive health. I think we all know what it feels like when our digestive system isn't working properly. Terrible, right? 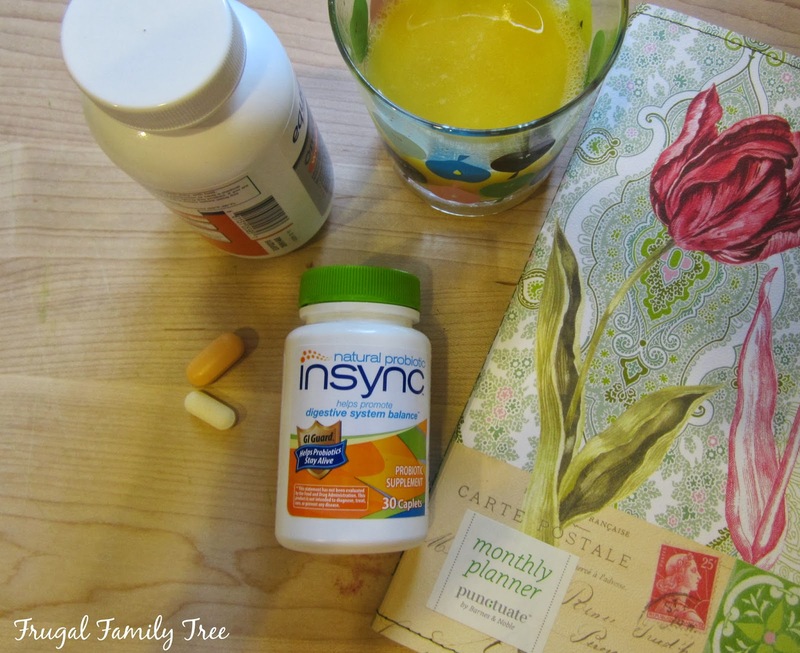 When I was shopping at Walgreens awhile back, I came across Insync Probiotic. 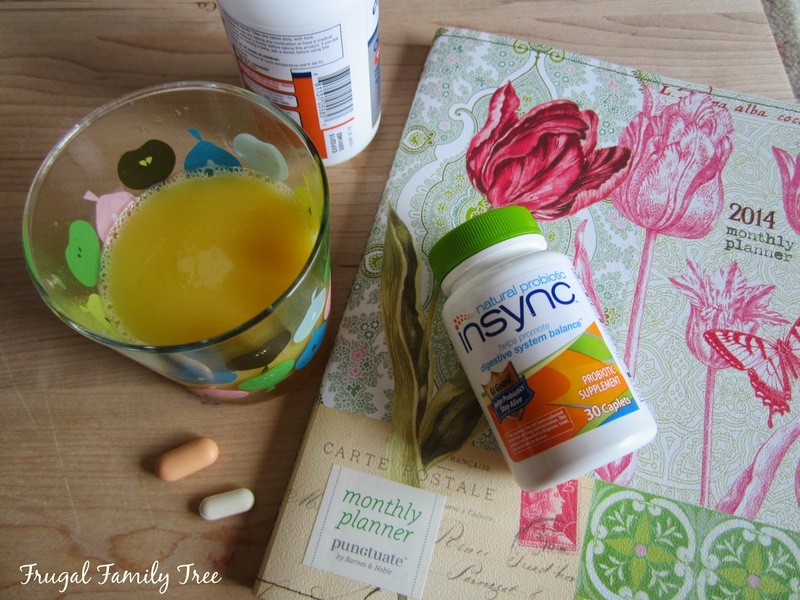 Now, I've used lots of different kinds of probiotics before, but Insync is a #naturalprobiotic. This is a gradual release probiotic that includes six strains of natural probiotics to help keep your digestive system healthy and functioning. 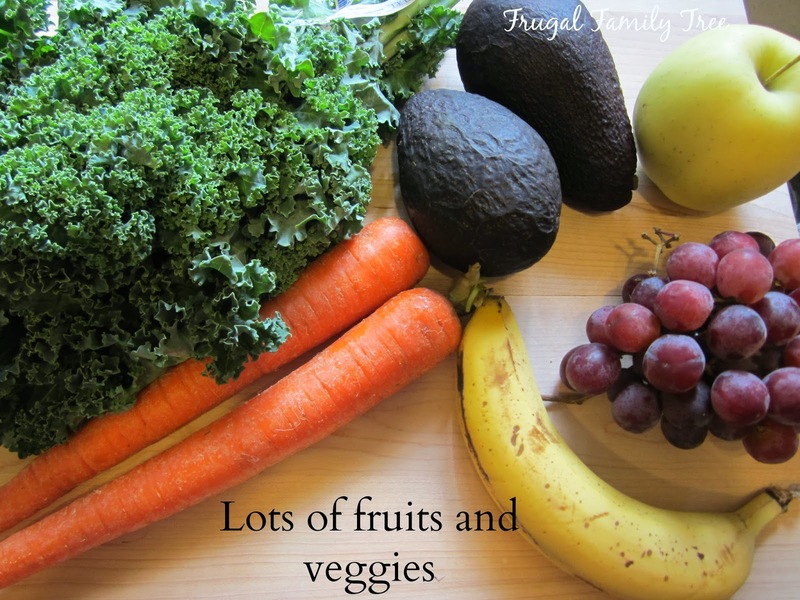 I am so lucky that I love all kinds of fruits and veggies, and eat some every day. They provide fiber that our bodies need to be healthy. I've learned to love kale, and it's very good in salads, soups, or sautéed with olive oil and a little garlic. And avocados contain healthy fats that are good for us, so I put them in my salad or on my sandwiches whenever I can. What I choose to eat is within my control, and so I'm really trying to eat a healthy diet because I know how important it is. Eating healthy certainly does play a role in good digestive health, I know how my system gets out of whack when I don't. I enjoy walking for exercise, but in the winter months, the freezing rain and winds usually keep me indoors. That's one of the reasons I love my yoga so much, I can do it at home or in a class, and it doesn't matter one bit if we are having bad weather. I've been doing yoga for a few years now, and I honestly can't say enough about how good it is for me. 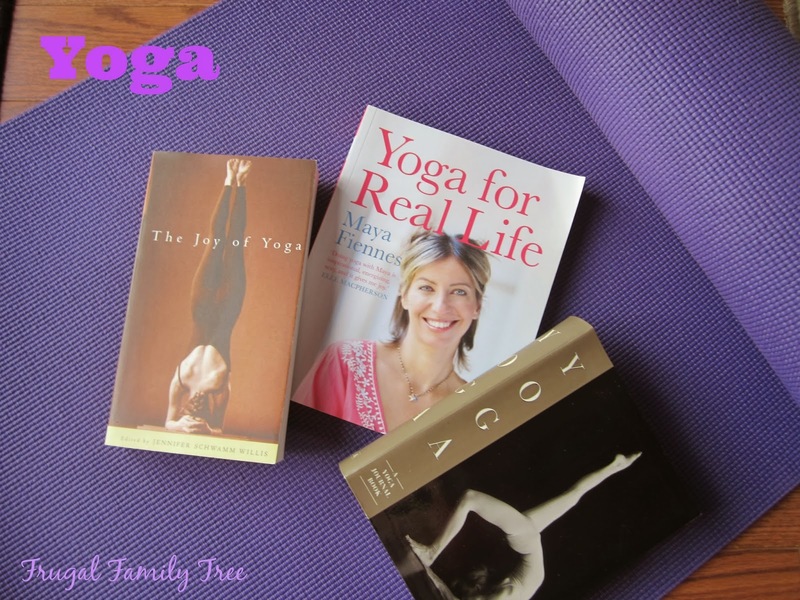 It helps me maintain flexible joints, steadies my balance, keeps me calm, and there are even poses that help you digest your food better. There is such a difference in how I feel when I take my daily probiotic and do my yoga, that I really try not to skip doing either of them. I still have to have my early morning cup of coffee with creamer, and I don't want to give that up. But instead of having more coffee during the day, with all that sugar and calories, I've started drinking green tea. 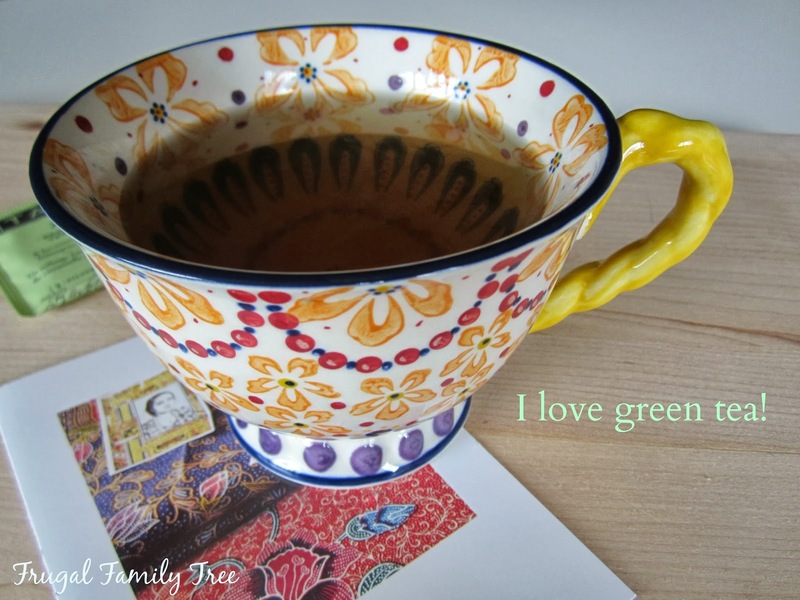 There are lots of different kinds of green tea, and my favorites are with lemon, or mint. Green tea is actually very healthy for you, and offers so many benefits to drinking it. I slowly cut back on the sugar I added, and now I can drink it and enjoy it with no sugar at all. Of course, like lots of other people, my New Year's resolution was to lose weight and be healthier. That went out the door, about three days later, because all those yummy holiday treats were still around, and I couldn't help myself. That's when I knew I had to take control of my body, and do everything I can to make it as healthy and well functioning as I possibly can. So, I'm eating better, doing my yoga, drinking my green tea, taking my multi-vitamin, and my Insync Probiotic caplet. And my digestive health is really good right now. My tummy feels good, morning and night, and that makes me happy. If you'd like to find out more information on Insync Probiotic, you can visit their website. You can also find them on Facebook, and follow them on Twitter.